Should You Bail Your Child Out? “Hi Mom,” came the timid voice on the other end of the line. “Hi sweetie, what’s up?” I responded. I knew what was up. She had forgotten something at home. “I forgot my tennis shoes and I have P.E. today. Can you bring them to me?” she sweetly inquired. YES! I wanted to shout. I will bring them right to you! I know you fear getting in trouble. I know you want to be the perfect student who always does what she is supposed to do. I know you love P.E. It is one of your favorite classes and you want to be able to participate. So I held my breath for a few seconds and fought with myself. “No, sweetie. I am sorry. I won’t,” came my reply. We said our good-byes and hung-up. For the next couple of hours, I still fought with myself. P.E. was right before lunch, so I had time to debate. I didn’t have anything else to do. No appointment I needed to get to. The school is just right down the street. It is easy for me to get there and back, even with a four year old in tow. So why didn’t I take the dang shoes?!? Because I want my daughter to learn to have personal responsibility. I can’t bail her out every single time she forgets something or makes a mistake. Some day, she will be in a situation where she needs to remember and I won’t be there to save her. She needs to be capable of taking care of herself before she is in a situation where it really matters. Does it really matter if she forgot her gym shoes in fourth grade? No. Not in the grand scheme of her life. She might get a lecture from her P.E. teacher, but that is it. No grade is dependent upon her shoes, only her pride and her ability to play along fully this one day. I couldn’t bail her out that day because I want her to grow to be her best self. Teaching personal responsibility is a fine balancing act. I want my children to be responsible, but I also want them to grow up knowing grace so they can show grace to others. I have pondered this over the years. Initially I started our school years out with a strict, “No bail-outs” policy in mind, but I quickly grew concerned that my children wouldn’t learn to show patience and grace with others if they were never saved by their mother. My policy now is that I will definitely save you if it is not a habit you have developed. If it is the first time you have called me all year and you forgot something, I will be there in less than five minutes. If it is only the second time this year, and the first was a couple of months ago, no problem. I will bring it to you. People are human and people make mistakes. I want my children to understand that is okay. But as soon as it becomes a habit, we have a problem and you need to learn to take care of yourself. This was not the second, third, or even fourth time my sweet daughter had called this school year. The last time she called, I talked with her and told her this was becoming a habit. She had forgotten something, from her homework to her shoes, several times in the last few weeks. The last time she called, I told her I would bring it that time, but that she needed to work on remembering because I wouldn’t bring it the next time. That day that I said no, when she had been getting ready for school that morning, she sat reading a book. I asked if she was all the way ready for school. Yes she had told me. I asked if she was sure she had everything she needed in her backpack. “Yep!” She read on. So when she called me that morning, timidly because she knew what the answer would be before she even called, I had to be her mother. Not the “cool” mom, “nicest” mom, nor the “best” mom in the eyes of the other kids. I had to be a responsible mom. A mom focused on helping my daughter learn responsibility in life. So even though it hurt my heart to tell that sweet girl no, it was the best thing I could do for her. When she got home from school that day, we talked about it. I explained what had happened that morning. I reminded her of her many times she had left something home. I reminded her of the last time she forgot her shoes and I told her it would be the last time I would bring them. I told her I didn’t bring her shoes to her that day because I love her. “Huh?” she asked, clearly confused. She wasn’t mad or upset, but she didn’t see how my not bringing the shoes had to do with my love for her. I explained to her that my job was to help her learn to be responsible for herself so she can grow up to be a responsible adult who can take care of herself and others. I asked her if she thought she would try to remember her shoes if I kept bringing them to her. She told me no. I asked her if she thought she would try to remember now. She responded she would. I explained that her not having her P.E. shoes was a low-risk time to learn to have personal responsibility. When she was an adult and had bills to pay, a job to do, or a child to take care of, the consequences wouldn’t be so mild. Since that day, she hasn’t forgotten a single thing. She carefully checks to make sure she has everything in her backpack. She knows her bail-outs have run out. She is taking responsibility for herself. 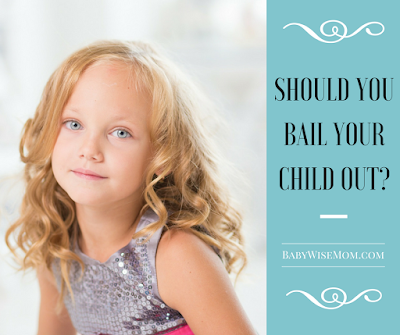 Should you bail your child out? Sometimes, yes. But sometimes, no. 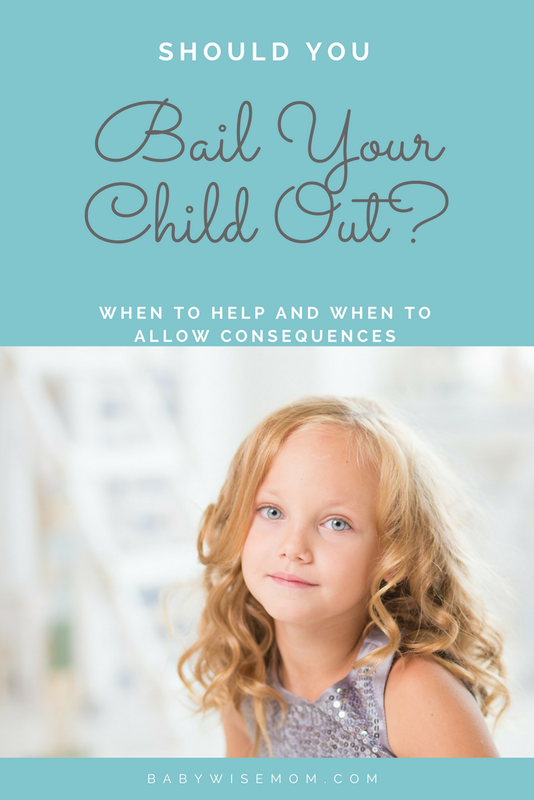 Sometimes, we need to let our children struggle through the consequences of these situations they brought upon themselves so they can learn to take better control of their lives and have more favorable consequences in the future. “I am sorry, sweetie, but no” might just be the best phrase you can speak to your child that day.